The Egyptian embassy has hosted a function a t which Ambassador Omar Metwally has addressed the Capital Jewish Forum in Canberra. 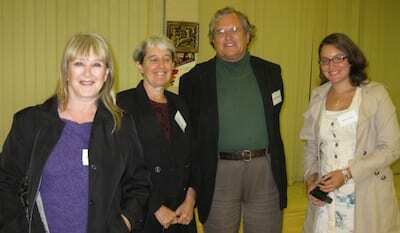 CJF founder Manny Waks told J-Wire that among the guests at the function were two had made the trip to Canberra from Melbourne and one from Sydney. He announced that the guest at next month’s function will be the United States’ Ambassador Jeffrey Bleich. 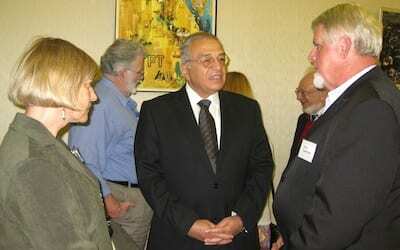 Around thirty CJF members, from diverse professional backgrounds, had the opportunity to hear Ambassador Metwally speak on ‘The role of President Sadat in achieving peace between Egypt and Israel in the late 1970s, and the current challenges facing the peace process in the Middle East’ at the Egyptian Embassy. Ambassador Metwally also discussed why the settlement of the Arab-Israeli conflict is central to security and stability in the region. The Embassy also generously offered CJF members a range of traditional Egyptian delicacies. CJF founder and director Manny Waks commented: “On behalf of the CJF I would like to sincerely thank Ambassador Metwally for so kindly and generously hosting the CJF at his Embassy. We greatly appreciated the Ambassador’s frank responses to the diverse range of questions, including sharing his views on complex and sensitive issues such as the Israeli-Arab conflict, the nuclear debate and internal Egyptian matters. A prominent issue raised by a number of CJF members was in relation to recognising Israel as a Jewish State. While the Ambassador made his views very clear on the matter – that religion should have nothing to do with Israel’s identity, to the discomfort of a number of members – it was a great example of the rigorous discussion and the manner in which that takes place at CJF events. Generally speaking, CJF members are encouraged to ask or state anything of relevance at CJF events, provided it is done so respectfully.” J-Wire publishes Ambassador Metwally’s address in full: It is a pleasure to welcome you all to the embassy of Egypt this evening. I would like first to thank the Capital Jewish Forum for providing me with the opportunity to share with this distinguished audience some thoughts about the Role of President Sadat in achieving peace between Egypt and Israel in the late 1970s, and the current challenges facing the peace process in the Middle East. I am very much convinced that a final and just settlement of the Arab Israeli conflict is central to security and stability of the international community, therefore the Middle East peace process requires full appreciation of the past, full understanding of the present and farsighted vision for the future. Throughout time, the decisions made by leaders have dramatically changed the course of history. While some people say that peace is an impossible dream in the Middle East, there are people who defy great odds to broker peace in a war-torn land. For sure, President Anwar Al Sadat is one of them, and his decision to make peace with Israel is a clear example. President Sadat is considered a pioneer of peace not only in the Middle East but also all over the world because of his display of courage and flexibility in dealing with the Arab – Israeli conflict. He was willing to ignore past Arab-Israeli hatreds, and was daring enough to do what had been unthinkable in the area, as he expressed his willingness to have normal relations with Israel if it opts to the road of peace. Sadat sought the way of peace since he came to power in late 1970, but when his attempt to launch peace negotiations in 1971 failed, he launched the October War 1973 to liberate Sinai and strengthen the bargaining position of Egypt in the peace negotiations with Israel. The outcome of that war made Israel recognize the importance of peace to all peoples in the region. His willingness and dedication to peace led to the first peace treaty between the Arabs and Israel signed at the White House on March 26, 1979. His aim was to remove and shatter all barriers of doubt, mistrust, hatred and fear between the two sides in order to end many decades of confrontation and launch a new era of coexistence and cooperation. The point of the treaty was to, not only create peace between Israel and Egypt, but also between Israel and its Arab neighbors. The desired result of the treaty was to bring the war atmosphere to an end, and to establish peace where everyone can live safely. The treaty asks that Israel withdraws from Arab lands, under the circumstances that the Arab population accepts the existence of Israel. •	Prior to the Palestinian elections, Egypt specifically informed the US that Hamas would win. It recommended postponing it. The Bush Administration refused any delay and ultimately Hamas was victorious. After Hamas won a legitimate democratic election in the West Bank and Gaza, Israel and the US led the International Community to isolate Hamas. The marginalisation of Hamas is problematic. At the same time, external entities are utilising Hamas for their own agenda. Egypt is doing what it can in terms of reconciliation between Fatah and Hamas. •	The Palestinian refugee issue is resolvable – it is not an obstacle to the peace talks. In numerous discussions between Israeli and Palestinian negotiators understanding has already been reached that only a symbolic number of refugees will return to Israel itself, while the remainder will return to the future Palestinian state. Besides, many Palestinians would prefer to remain where they currently are (e.g. those in the US, Australia). •	In relation to the reports that surfaced several years ago that alleged the Arab League – led by former Egyptian Foreign Minister Amre Moussa – specifically instructed the late Yasser Arafat to reject the Camp David peace talks due to its objection to the Palestinians conceding any part of Jerusalem to Israel, the Arab League leader himself informed the Ambassador that these reports are simply wrong. This instruction was never given. •	Gaza is under the responsibility of Israel. Nonetheless, Egypt is permitting the passage of people and goods for humanitarian purposes. •	A new Palestinian state will succeed and prosper – Palestinians are well educated and a talented people. However, their success will largely depend on the international community, including Israel. •	We believe that Jerusalem could be two capitals, East Jerusalem and West Jerusalem, with East Jerusalem as the capital of Palestine and West Jerusalem as the capital of Israel. There could be international control over the Holy places. •	While conceding that anti-Jewish sentiments occurs in the Egyptian media, and this is unacceptable, it is mainly due to the many media outlets that service the large population, and the perception that exists among the population that Israel is not really interested in peace – it merely reflects the sentiments expressed by some people. •	Trade figures between Israel and Egypt are increasing. Many Israelis travel to Egypt for holidays (mainly to Sinai and Tabah). At the highest level there is a close relationship between the two countries. However, these relationships are not as close as they were during the Begin-Sadat era. But Middle East peace is a must and Egypt wants to achieve it, including doing what it can in relation to the Israeli-Palestinian peace talks. •	Egypt aims to make the Middle East region free of nuclear arms. The current circumstances make this very challenging – Israel has nuclear weapons and Iran may be attempting to obtain it. Therefore others may legitimately consider obtaining such weapons too. •	There is no concern for the post-Mubarak era. Egypt has “always been a land of moderation”. Of course there are extremist elements within Egypt, as there are in most countries. However, Egypt is a strong country with strong institutions. •	Egypt, as a civil, democratic and secular state, objects to defining Israel as a Jewish State. Israel is a sovereign state. But a Jewish State by definition is highly problematic for the 20% of its non-Jewish citizens. It is discriminatory. Will they be expelled? There needs to be a better understanding of the definition of a Jewish State. States should be about politics, not religion. •	Australia can have a more active role in the Middle East peace talks. There has been a noticeable attempt by the current Australian Administration to contribute more to peace in the Middle East. A number of countries could do more to support the peace efforts of the US. Following the CJF launch in August 2009 by Mr Mark Dreyfus QC, MP, at the Australian Parliament House, other distinguished presenters featured the Israeli, Indonesian, Jordanian and Turkish ambassadors, the Palestinian Territories’ Head of Delegation, Australian Competition & Consumer Commission Chairman and the Multicultural Affairs and Settlement Services Parliamentary Secretary. Other guests who have confirmed their attendance include the Federal Shadow Deputy Leader, the Federal Shadow Treasurer, the Office of National Assessments Director-General, the current and former Australian ambassadors to Israel, the Australian Federal Police Commissioner, the Australian Ambassador for Counter-Terrorism, the Australian Ambassador to the EU, the Pakistani High Commissioner, and the US, EU and Hungarian ambassadors. To the person who commented, please do not speak of something that is not true. If you are not sure of what you are saying then please refer to Manny Waks the CJF founder. He will tell you that they did tell the Egyptian Embassy they would pay for the food , but the Egyptian Embassy of course refused and they did offer all the members free food and drinks. “The Embassy also generously offered CJF members a range of traditional Egyptian delicacies.” – this is not true! The members had to pay for these delicacies, so they were not ‘generously offered’! This was simply catering supplied at a cost!